Following the Queen's visit to Birmingham last week to open the new Birmingham New Street Station, extensions to Midland Metro have been announced which will provide good connections with HS2. The extensions are part of an £8 billion investment in the West Midlands. Transport schemes worth almost £2 billion are included in the investment, which has accompanied a major devolution deal signed between the West Midlands Combined Authority and the Government. 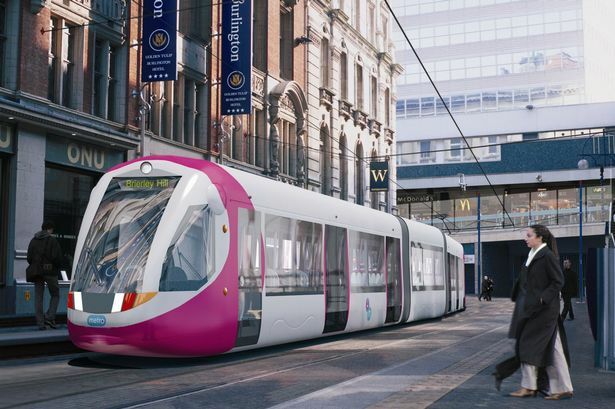 A new 'HS2 connectivity package' will include new tram lines from the HS2 station at Birmingham Curzon Street to Birmingham Airport via Bordesley Green and Chelmsley Wood, and between Wednesbury and Brierley Hill -- a destination which was an aspiration of local Metro planners even before the first section opened in 1999 between Snow Hill and Wolverhampton St George's. Other aspects of the package include potential improvements along the existing West Coast Main Line through the West Midlands and also a 'Sprint' rapid transit network. It is also hoped to improve other rail links, particularly with the East Midlands, as part of the Midland Connect partnership of local authorities and businesses in the region..
Councillor Roger Lawrence, chair of the West Midlands Integrated Transport Authority, said: “This is the biggest devolution deal done to date. The agreement will see Whitehall make an annual contribution of £40 million for 30 years to support investment worth £8 billion, which it claimed will support the creation of more than half a million jobs. Cllr Lawrence continued: “This is fantastic news, both for public transport in the West Midlands region but also for freight and other users of the road and rail network. “We can put in place schemes to help drive the regional economy forward, tackle pollution and congestion and get people to where they want to go.